Baltimore has a new dedicated passenger cruise terminal at South Locust Point. The new Baltimore cruise terminal is located just minutes from the famous Inner Harbor and just off of I-95. It's just a ten minute ride from BWI Airport. 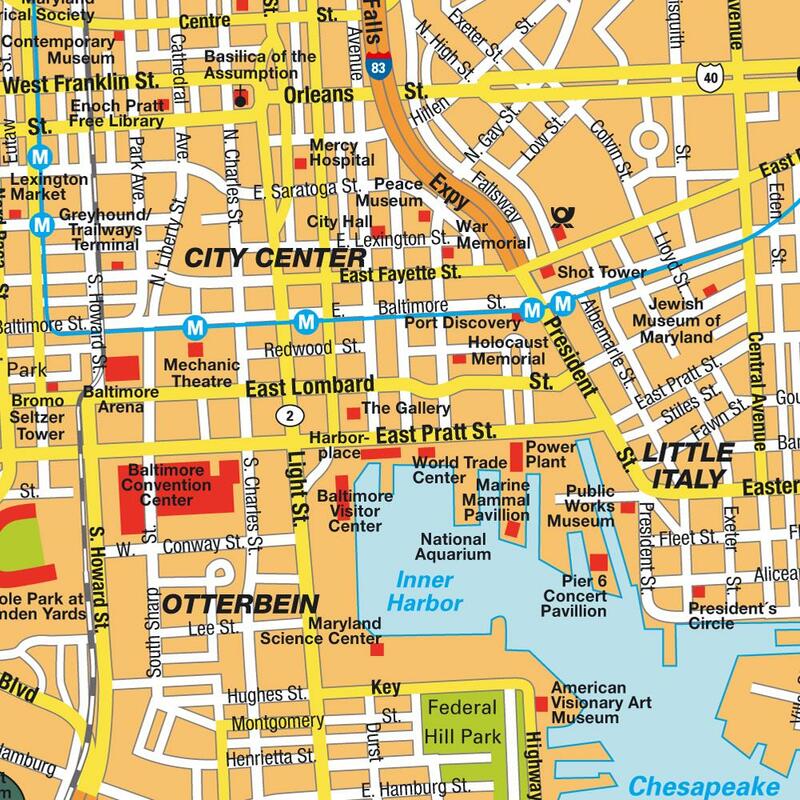 Both Annapolis and Washington can be reached by car from the Baltimore cruise port in under an hour. Cruise passengers will have easy access to the Port of Baltimore South Locust Point Marine Terminal by private car or taxi. The port is 3 miles from downtown. Taxis are at the terminal. About $5 one way. Parking ar the port is $15 a day. No advanced reservations are required to park in the secured, long-term lots which are located within walking distance of the Cruise Maryland Terminal. BWI Airport is located 10 miles south of Baltimore City and it is just 10.5 miles from Maryland's cruise terminal at South Locust Point. The cab fare is 35$ per taxi set by the state. Some offer special cruise & park deals. Printable map to take along on the cruise. Check here for festivals and events in Baltimore when you are in port. With something around every corner to either see or do, Baltimore is certainly an exciting place to visit. While here you may want to explore a few of our famous Baltimore Museums such as the Baltimore Aquarium, the Maryland Science Center, B&O Railroad Museum, The National Great Blacks In Wax Museum, or The Reginald F. Lewis Museum of Maryland African American History. Baltimore also has a very rich cultural history and by touring a historic site like Fort McHenry - home of the National Anthem - you will gain a new perspective of Baltimore. Inner Harbor is home to many tasty restaurants, unique shopping, famous museums, live entertainment and local pubs and taverns. When you're in Baltimore, you're two feet away from almost everything. Many of Baltimore's hotels, attractions, restaurants and nightlife are located within comfortable walking distance of each other. You can see just what's in walking distance from where you're staying by checking the walking radius feature on our Baltimore Map. The Baltimore Water Taxi is an excursion on its own, stopping at places like Harborplace, the National Aquarium, the Maryland Science Center, Little Italy, Fell's Point, Canton Waterfront Park and Fort McHenry. Just 45 minutes from Baltimore, the charming, historic city of Annapolis once served as America's capital. Just off the Chesapeake Bay, Annapolis is steeped in colonial history and ambiance; the Annapolis State House, built in 1772, is the oldest state capitol in continuous operation in the U.S. At the U.S. Naval Academy, established in 1845, visit the chapel to view the elaborate stained glass windows, including one designed by Tiffany, and see the crypt of naval hero John Paul Jones. And we don't mind admitting it's a fabulous place for noshing (in everything from seedy taverns to chic cafes) and boutique shopping. Note: You'll need a car to make this trip. Visit the nation's capital. Washington D.C. is about an hour away by train (Amtrak and MARC, Maryland's regional railroad, both offer service between the cities) or by car. The obvious attractions, of course, are the Washington Monument, the Smithsonian Institution, the White House, Georgetown and the U.S. Capitol. You can spend an entire day and then some at the Inner Harbor. Start with Harborplace, a waterfront complex of two buildings, connected by a public plaza where performers can be found plying their trade on weekends. There are some 101 shops, 16 restaurants, and 40 food stands.